This rendering is of the proposed art to be placed on opposite corners at Fourth Street and Pacific Avenue in Bremerton. To give yourself a sense of the size of the sculptures, there is a human standing near the fisherman. The Bremerton City Council is supposed to consider the idea at the last meeting of the year, which is Wednesday. Bremerton could have more art downtown as a continuation of work done at the Memorial Plaza. 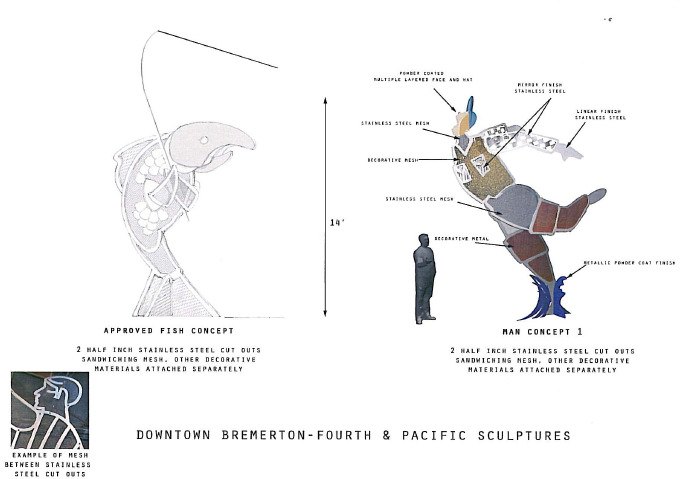 Gary Sexton, redevelopment projects administrator for the city, introduced the concept to the Bremerton City Council Wednesday, saying the statues of a fish and a fisherman would be another element to attract people downtown. The art was designed by Communication Arts Inc. of Boulder, Colo. and would be manufactured and installed by Dillon Works! of Mukilteo. That firm built and installed at least one statue at Safeco Field and the company’s site shows extensive work at the Minute Maid Park in Houston, where the Astros play. Sexton said the art is designed to be visible from a block away, establishing Fourth and Pacific as “ground zero” for downtown. Andrea Spencer, community development director, said the statues will draw visitors. “It’s really going to make Pacific Avenue the tourist destination we want it to be,” she said. You’ll notice in the picture that the fish is catching the fisherman. One statue would be at the Collective Visions corner at Fourth Street and Pacific Avenue, while the other would be near the Amy Burnett Gallery on the opposite corner. Both statues are about 14-feet high. Total cost is estimated to be about $250,000 using money from the Memorial Plaza project. Gehring was fine with the concept of the art, but didn’t like the fish and fisherman, saying it would be a better fit for Deer Lodge, Mont. For Bremerton, “It doesn’t represent the community, period,” Gehring said. This may be crass, but you are “bleeping” kidding me? This is so wrong on so many levels. REALLY!!!! You HAVE got to be kidding!! Our infrastructure appears to be in decay, and yet here we have a fine example of tax-payers being abused! That is OUR money you people are wanting to waste-not YOURS! YOU work for US, not the other way ’round! We don’t need “art” on the sidewalks! We need roads, lights, emergency services. This would attract visitors alright-visitors who would marvel at the colossal idiocy of taxpayers paying for this monstrous behemoth!! I submit the City Council and all involved with this statutory stupidity work on developing and cultivating the businesses in Bremerton. Businesses do crazy things like ATTRACT VISITORS, pay taxes, and are generally really good neighbors. And they also (generally)shy away from monstrous art! You are joking, right? West Port and Illwacco(sp) are fishing towns…not Bremerton. You don’t see a fishing fleet moored off Bremerton docks…our area is known for swimming, boating, snow and water skiing, mountain climbing, hiking…we eat salmon, oysters, clams, crabs…but I wouldn’t expect art of one to represent our area. Fish help us survive, as does other meat, vegetables and fruit. If a food group is necessary art for Bremerton, why not have art of a steer and the 4HR who takes the beef to fair to be auctioned? $250,000 for a fish and fisherman art in downtown Bremerton? You jest. Questions: 1.) Why would the city hire an out-of-town, out-of-state designer for a project in the middle of Bremerton’s arts’ district. 2.) Where’s the money coming from? 3.) Why a fishing theme when about the only fish caught in Bremerton waters are bullheads. In an era of tight city budgets, this flies in the face of common sense. Hard to imagine what would be most appropriate for Bremerton. We already have Rosie the Riveter on Pacific and Burwell; Hal’s Corner has the ack-ack guns; the Lone Sailor on the port’s dock; the propeller with shipyard worker and youngster on the boardwalk. It may be time to go back further in time to the Salish tribes that first inhabited this area. Or the loggers who tamed (some would say destroyed) the area. Captain Renton built the first sawmill in Mannette and his son was the first-born white child of Kitsap County. Or, if you want to stick with a military theme, what about the US Army’s dirigible units or a statue of FDR addressing the crowds at PSNS during WWII? Something other than a fish, please. And while you are at it, make it something that a local can make! A fish and a Fisherman…The joke about using a fish and fishing for Bremerton is to guess that out of boredom and lack of imagination, Sexton couldn’t think of anything else. How about Bremerton honoring women that through the years have borne, raised, nurtured and/or forged their way to distinction in a man’s world. How about Bremerton art showing the woman who directly or indirectly helped shape Bremerton. The Navy and Bremerton Shipyard made Bremerton prosper. Norm Dicks mom should be considered. Mrs. Dicks raised a son who made a difference and greatly helped Bremerton prosper. Who was the first woman to work in the Navy Yard? Who is/was the most influential black woman, white woman, oriental woman, native American woman? Of the different ethnic races in Bremerton, let each nominate the woman they want to honor for her work, energy and dedication to betterment of family, neighborhood, town and community…NOT a fish! I’ve never heard of a fish improving its neighborhood nor heard of one graduating. A fish swims in the same school forever…they are food, like a carrot. We eat them because we’re hungry and fish are food…like pork-lets or beef-lets. We don’t honor feed-lot owners, butchers or meat wrappers…why fish or fishermen? Bremerton … honor the women..not fish… with artwork. I will nominate Adele…she most certainly has impacted the political scene in our town and state…and reported the hard way, she was first. Bremerton, wake-up. Do the right thing and REALLY help bring in the tourists…most of them women. Honor and recognize Bremerton’s women. So with the economy in the tank, we’re paying people not only out of the area to build this, but people outside the state for the concept art! There is no economic development here at all. We get a crappy statue and yet more money leaving the city and county. All at “ground zero”?! What a disrespectful use of that term. Ground Zero is the site directly below, directly above, or at the point of detonation of an explosion. The World Trade Center, Hiroshima, and Nagasaki are all images of a true ground zero. About the only “ground zero” we have here is Sexton’s office. Perhap’s a better statue would be a 14′ one of Sexton using his brain for a suppository. WTF? Fisherman and Fish in Downtown Bremerton? SERIOUSLY? Come on Gary! If you are going to spend that kind of money, perhaps you should get opinions of people in Bremerton. Oh wait! I forgot, it’s all about you, not the people of Bremerton! 3.) Why a fishing theme when about the only fish caught in Bremerton waters are bullheads? I think it’s PERFECT. The man represents the taxpayer. The salmon represents… the salmon. The only thing missing is the statue of the “tribe” saying they are entitled to half the “catch”. My apologies to many of you who had to wait days for your posts to get published. On the blogs we approve all first-time commenters before they go live. I don’t receive the e-mails for comments on this blog and was unaware so many were waiting. Now that you’ve been accepted here, you shouldn’t have to wait again. I hope Gary made his comments about local artists after requesting RFPs.